Like to play war games? Try our line of fan-made game aids to give you a better or different experience! In the shattered depths of the bone-dust and glass underworld, fighters vie for glory. 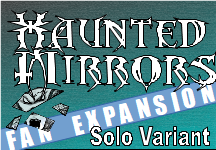 Now, even the city itself has made a challenge in the form of haunted mirrors that strike and move from the ever-changing shadows. Can your Warband still accomplish its objectives... or will they be lost in the depths of their own sordid reflections? Simply add the contents of this box with your favorite Underworlds core game materials, and you are ready to play a great solo variant of a great game. In the shattered depths of the bone-dust and glass underworld, fighters vie for glory. 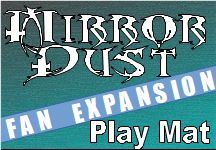 Now, you can keep track of your clashes with the Mirror Dust Game Mat for use with your favorite Underworlds game. Simply lay your play mat next to your boards, and you are ready for battle.